3D Realms' follow-up to Duke Nukem 3D is low-brow, arguably racist, and can now be yours for the very attractive price of "totally free." 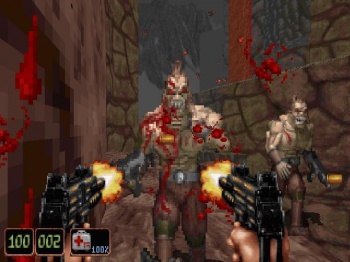 In 1997, 3D Realms was riding high on the success of Duke Nukem 3D. That game blended the intense first-person shooter action of DOOM with intricately designed levels and juvenile humor which was perfectly suited for an audience comprised stereotypically of teenaged boys. Hoping to replicate that success, 3D Realms' next project was a game called Shadow Warrior, which built on Duke 3D's shooter action, but went even further with the poop jokes. If you're having trouble picturing such a game, let me just say this: The protagonist of Shadow Warrior is named "Lo Wang." Yes, that's the punchline. Despite its low-brow nature, Shadow Warrior was a pretty solid shooter in the vein of Duke 3D, which is great news given that the game is now available on Steam for free download. This isn't one of those "free to play" schemes where you have to pay for half of the game's content after it's got its hooks in you either; Shadow Warrior Classic is totally, 100% free. Fire up your Steam account, hit the download button, and the game is all yours. Normally this is where I'd rattle off a list of the game's system requirements, but if you're comfortably navigating The Escapist on a PC you probably won't have any issues running Shadow Warrior at its full graphical splendor. This is a first-person shooter from 1997 after all, so it's only slightly more taxing than DOOM or Duke 3D. It's not quite as seminal as either of those titles, but hey, it's free. You can't complain too much.